Shaun Wane insists he has not been told Sam Tomkins will leave Wigan Warriors. The full-back, out of contract at the end of the season, is expected to move to Catalans Dragons, whose interest surfaced earlier this week. But Wane insists Tomkins, who returned to Wigan in 2016 from a stint with the New Zealand Warriors in the NRL, is still part of his plans. 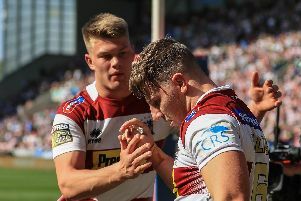 “Sam’s a great player and lots of teams are going to be looking at him,” said Wane when asked about Catalans’ interest. “As far as I’m concerned he’s my player and until Ian (Lenagan) and Kris (Radlinski) tell me any differently he’s playing for me. I’ve not heard anything. Wigan have a one-year option on Tomkins’ current deal, which would keep him at the DW Stadium next season if exercised, but it is expected the 29-year-old will be playing in a Dragons’ shirt next term.